The Mechanics Hall was enlarged and improved to commemorate those from the district who served in World War One. It was named the Soldiers` Memorial Hall and Mechanics` Institute. The money for the improvements was raised by the returned soldiers. The matter of enlarging the present Mechanics' Hall or of building a new one seems to have been indefinitely shelved. For some time past the R.S.S.I.L A. have held sports with a view of erecting a Soldiers` Memorial Hall, and a fair amount of money has been raised, but not sufficient to erect a new building. Negotiations were entered into between the Mechanics' committee and the R.S. A., but an appointment to discuss the matter lapsed. At present each committee is waiting for the other to move. Benalla Standard (Vic), 27 March 1925. 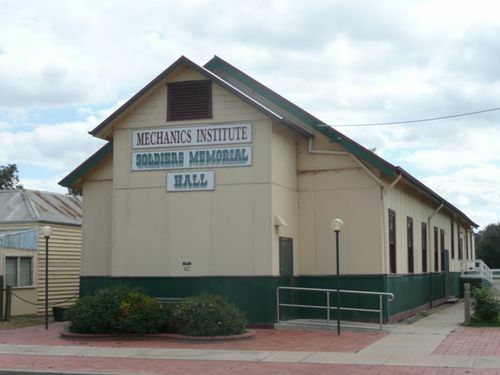 The largest crowd seen at a function in Tungamah was that which attended the ball held on Tuesday evening, 27th ult., to mark the official opening of the enlarged and improved hall, formerly the Mechanics' Institute, but now designated the Soldiers' Memorial Hall and Mechanics' Institute. It is understood that some years ago a considerable sum of money was raised by the returned soldiers for the purpose of a memorial hall. It was suggested that the Mechanics' hall committee and the returned soldiers could combine forces to achieving this object, but differences of opinion between the two bodies prevented this being done earlier. Negotiations have been taking place tor a long time and ultimately a conclusion satifactory to both bodies was reached. The returned soldiers made their funds available and a scheme tor improving and enlarging the hall was entered upon. The hall has been lined throughout and the stage brought up to modern requirements, making the building very comfortable and suitable for every form of entertainment. A supper room, capable of seating a very large number has been added together with a kitchen, equipped with up-to-date conveniences. Altogether the hall is one of which Tungamah can be proud and it compares more than favorably with any hall in other towns of similar size. Cobram Courier (Vic), 5 August 1937.